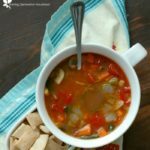 The classic nostalgia of that red can of vegetable soup, loaded with mineral rich bone broth and packed with nourishing vegetables, all in about 20 minutes! A couple weeks ago I showed a quick Instagram Story about my prep day, and I just happened to be making a simple, quick, and frugal vegetable soup. 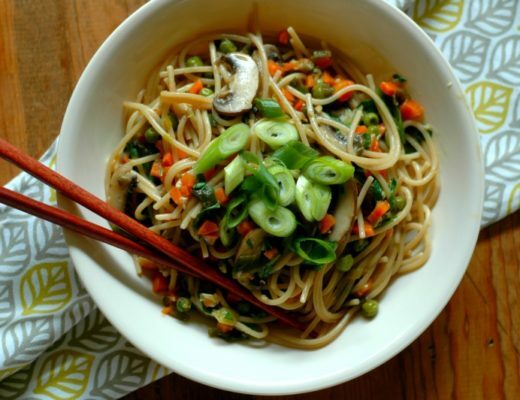 One that I make quite often with varying vegetables depending on what I have in house. I had mentioned that the flavor is very similar to those little red cans of veggie soup in the soup isle at the grocery store, and you all were very excited about learning how to make it! Even though the nutrition in those little red cans is not stellar, it really brings back a lot of memories for people, I think, and you really can make it taste amazing with real food so your kids can have the same memories! That same sweet, tomato-y broth that the those store bought cans of veggie soup have is very easy to duplicate using real food! Something magical happens when you get that veg down in some butter and let a little time do some work on it. It sweetens the tomato paste as it cooks, and makes for a really delicious broth! If it’s in season, it will work! 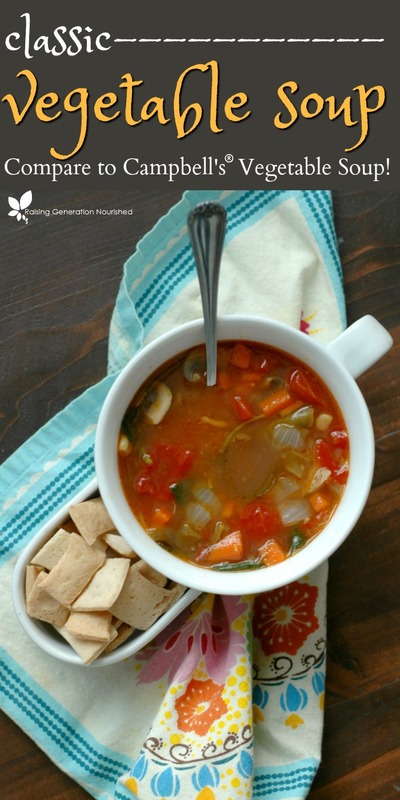 The beauty of this soup is that it really can be tailored to the veggies your family likes, and what is in season. You can pack it out with as much veg as I do, or add more broth if you want it a brothier soup. I like keeping the veggies pretty simple – similar to that in the red can, with a few favorite add-ins like mushrooms, and, because I’m always looking for a way to get green in, a couple handfuls of spinach always wilt in so easily adding more nutrient punch to this simple soup. 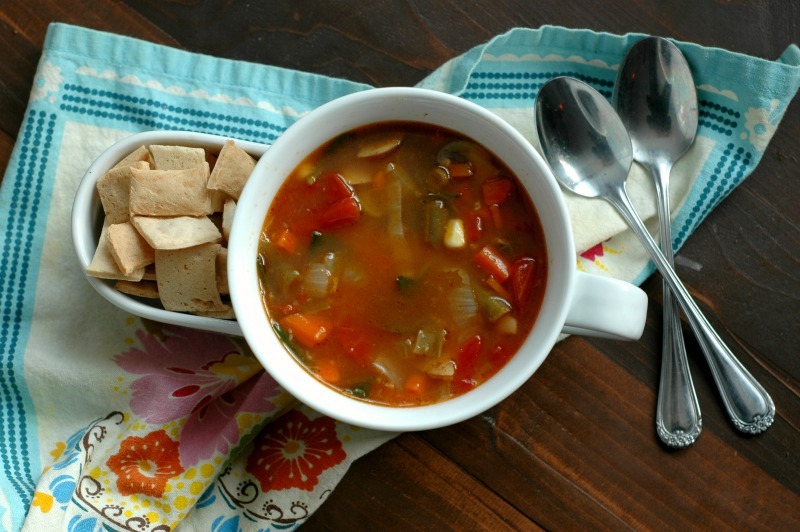 Because this simple vegetable soup freezes up so nice, it makes a great lunchbox addition. I shoot for a veggie at every meal, so for my kids, soup fills that veg gap a lot of the time. I like to freeze in quart containers for my crew so it is easy to pull out one container that will feed all 3 girls and myself for one meal. You can freeze in smaller portions if you need. I can also send a quart container with my husband to work for the week that he can have here and there, warming it up in his travel Crockpot. Sometimes those little guys have issues with “pieces” – I know I have one of those right now and there’s no rhyme or reason to it other than…she’s 3! She waivers between not caring about the pieces and caring very deeply about it, so I have a couple tips to save your sanity! Blend it up! 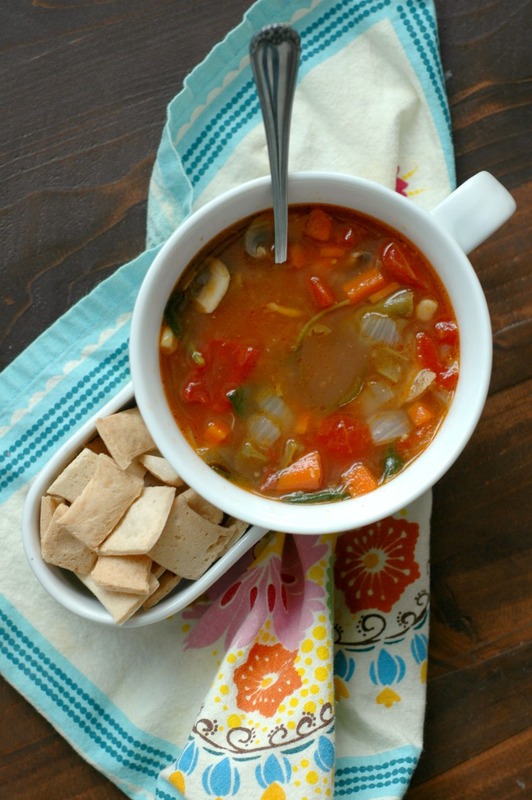 Most little ones are more apt to eating smooth, texture free soup so just buzz it up. I have gone from complete refusal to more than willing to eat the soup with just this approach. Choose your battle and just get it into them that way, I say! Let them pick out what veggies are going in. If they get a say in it, they are more likely to eat it. You can set it all out in front of them and ask them to pick 2-3 vegetables they want (in addition to the onion, garlic, tomato paste etc). On that same note you can let them help you cook it too! Make sure it is a good temperature. I don’t talk about this often enough, but most kids are really sensitive to extreme temperatures of food. In fact what is warm or sip-able to you, is most likely scalding hot to them. Same goes cold food. My toddlers always preferred lukewarm to room temp soup, and when it came to stuff right out of the fridge, I usually let it warm up on the counter for a bit. 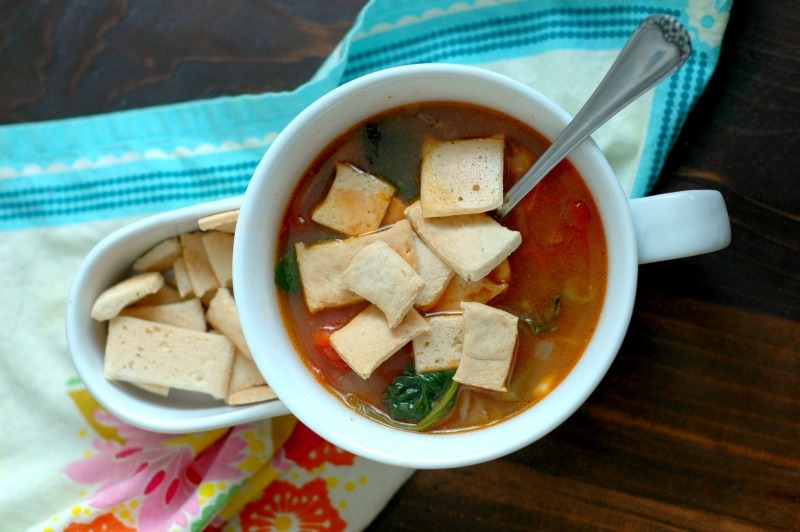 Soup and crackers go hand in hand! Here are some ideas for you to keep in the pantry for easy additions to the lunchbox packing! 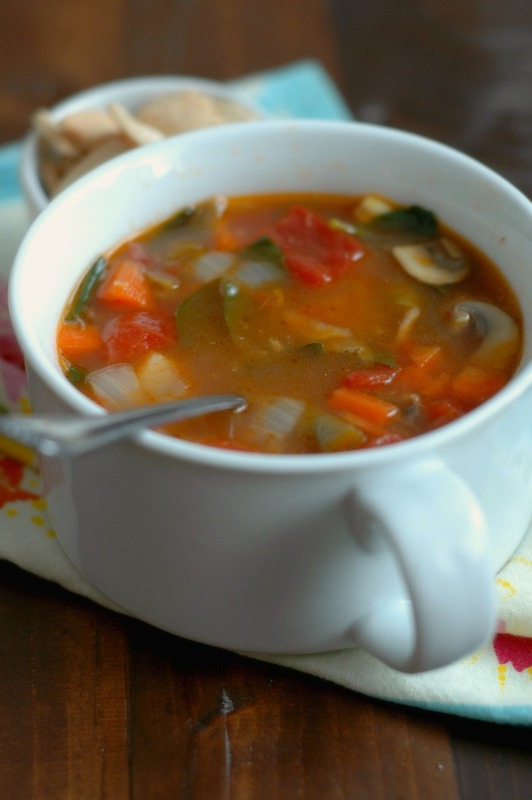 The classic nostalgia of that red can of vegetable soup, loaded with mineral-rich bone broth and packed with nourishing vegetables, all in about 20 minutes! In a large soup pot, melt the friendly fat, and add the onion, carrot, green beans, potato, mushrooms, and corn with a big pinch of sea salt. Cook over medium/medium-high heat for about 7 minutes until the veggies soften. Add the garlic and tomato paste, stir to combine, and cook for a couple minutes. Add the diced tomatoes and bone broth, and bring to a simmer for 5 minutes. Turn the heat off and wilt in the baby spinach, and then sea salt and pepper the soup to your taste. 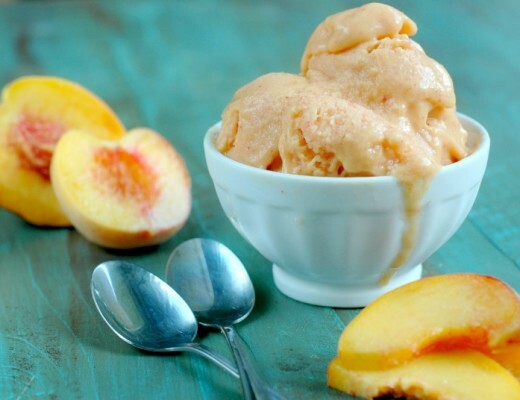 I used to eat the Campbell’s version all the time and I love this healthy version! Take me right back to my childhood. I love the idea to let the kids choose the veggies that go in the soup. I’m looking forward ro making this with my kids. They will love it!